The Linden Heritage Foundation welcomes Tim Stanley as our new IT manager. Tim is taking over the position from Dr. Jim Jacob, who retired from the post on January 14th, 2017. A newcomer to the Foundation as well as to the city of Linden, Tim was introduced to Linden by girlfriend Mandi Mathis. He plans to open a computer shop soon in the downtown Linden area. A father of three boys, Tim describes himself as a Jack-of-all-Tech and has worked as an IT professional for over twenty years. 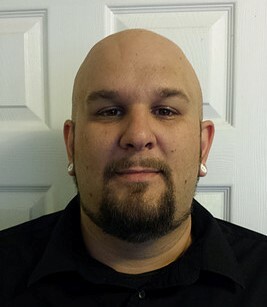 He brings a wide range of technical expertise to the table, and his background includes training at Kilgore College with a 2012 Associate’s Degree in Cisco Networking, along with over 200 industry and machine-specific certifications for a broad range of hardware and software platforms. Tim currently works as a self-employed contractor, providing remote support to business entities as well as on-site support for residential customers including families and individuals. We are deeply appreciative of Tim’s willingness to do this important work for the Linden Heritage Foundation on a pro bono basis. Local volunteers like Tim, with important skills and a generous community spirit to match, are what feeds the forward momentum toward achievement of Linden’s highest and best dreams. Please take a moment to warmly welcome Tim as the Linden Heritage Foundation’s Manager of Information Technology! < Previous Need a Record of your Dues or Donations? Thank you for joining with the Linden Heritage Foundation, in their endeavor to promote their wonderful City of Linden. In track the relay can only succeed if the baton is passed successfully from one runner to the next. Tim, thank you for volunteering to work with Jim Jacob to learn our system and bring your experience to fill the role of our IT manager. Further, welcome to Linden and my best wishes for success in your new business. Thanks for taking on this task Tim .